A chilly day in Clearwater, Florida. Today, with wind chills in the negatives and the world looking like a vast, frozen tundra, I’d gladly return to that chilly Clearwater day and romp around in nothing but my sports bra and undies. Yes. I'm that annoying person that takes a selfie (or in this case, an us-ie) at the starting line. Of course, there was much more to that December day than shivering through my purple capris, purple tank top, and purple hoodie (we were Team Purple People Feeders, so of course I had to dress the part). Our team raised over $500 for No Kid Hungry, my favoritest of all my favorite non-profits. As the top fundraisers, we were there for our victory lap, and nothing — not even a hurricane curbing our original plans to do the race in September — was going to stop us. Go here if you want to support No Kid Hungry. When the race organizers announced the rescheduled date of December 9, I thought, “No biggie! It’s Florida! It’ll be sunny and 75!” I sometimes forget how large Florida is. It’s not all Golden Girls sweating their asses off at Christmastime. Oh well. We were there, and we were cold, but we were going to do it. Many of you are probably thinking, “But in 60-degree weather, you warm up in no time once you start running!” Have we met? I do not run. I walk. Briskly, yes, but a walk nonetheless. Luckily, the purple hoodie I had on is a miracle worker when it comes to trapping body heat, so despite my snail’s pace, I was warmed up by mile two or so. Thank you, Target. This is not how Clearwater is supposed to look. Even in December. The race itself — kicked off by Health magazine fitness editor Roz Frazier (awesome name, amiright Frasier fans?) — was a would’ve-been-lovely-on-a-nicer-day route that took us across a bridge, through a little green area, and straight down the middle of the road of a downtown area. I love race routes that shut down streets — they make you feel like you own the place. Another thing I love about 5ks: We were done by mid-morning and had the whole day ahead of us. We decided to kick things off by taking advantage of the copious amounts of food samples and swag the different sponsors were giving away. 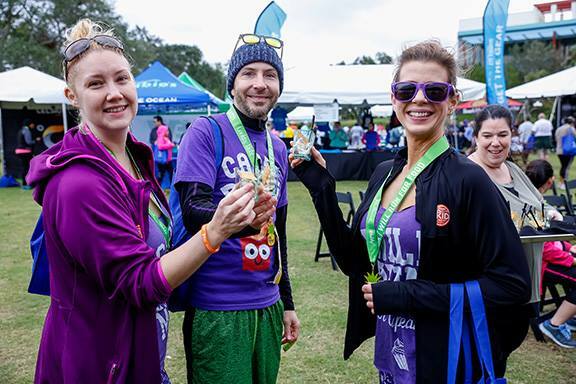 WINE at a 5K? Yes, please! Just as the name of the race implies, the vendors were a delightful blend of both the health-conscious and the tastebud-tantalizing. Natural markets and vitamin manufacturers intermingled with boozy chocolatiers and a AAA four-diamond restaurant. Warm muesli -- perfect for such a chilly day! In fact, it was the very four-diamond restaurant we were going to be dining at that evening. It shouldn’t come as a surprise that we made a beeline for that one. We introduced ourselves to the chef and staff of Ocean Hai, told them we’d be eating at their establishment that night, and asked for menu recommendations. As we enjoyed our samples of a delectable ceviche-style tuna salad with quinoa, we made a mental note to focus on the seafood offerings. To our right, down by the curb, a watermelon-juice company was literally giving away cases of fresh watermelon juice right out of their van. On a different day, in a different part of town, with a different product, it could’ve been a much more insidious operation. But on that day, we availed ourselves of a few cases and spent the next week drinking copious amounts of thirst-quenching watermelon nectar. They were giving away CASES of watermelon juice! Cocktail, anyone? Another restaurant gave us samples of (blessedly) warm muesli, and Cooking Light magazine did a demonstration of a healthy chicken salad recipe — I momentarily distracted the presenter when I gave an unintentionally sultry grunt at her mention of using fresh tarragon — and passed around samples of the concoction afterward. The adults-oriented section of the park was devoted to rum, wine, and beer. I focused on the rum and wine. Naked Turtle rum was handing out samples of cocktails made with their rum, which — thanks to their partnership with the Sea Turtle Conservancy — saves a baby turtle every time a bottle is purchased. That’s a happy hour I can get on board with! I can save the turtles by drinking RUM?! Sign me up! One of the vendors that most impressed me was MegaFood. They’ve got a well-rounded line of vitamins, supplements, and other healthy blends and from what I can tell, they’re very well-versed on holistic wellness and nutrition and get their ingredients from reliable sources. We hit them toward the end of the event, so were able to stock up on loads of free samples. My favorite, by far, is the Daily Turmeric Nutrient Booster. I sent my registered-dietician stepsister a shot of the nutrition label, and it passed her standards as well. I used the coupon I got at the 5k to buy some at our local Whole Foods, and add it to my protein shake in the morning. Chef kindly gave us a delicious (and personalized) dessert! 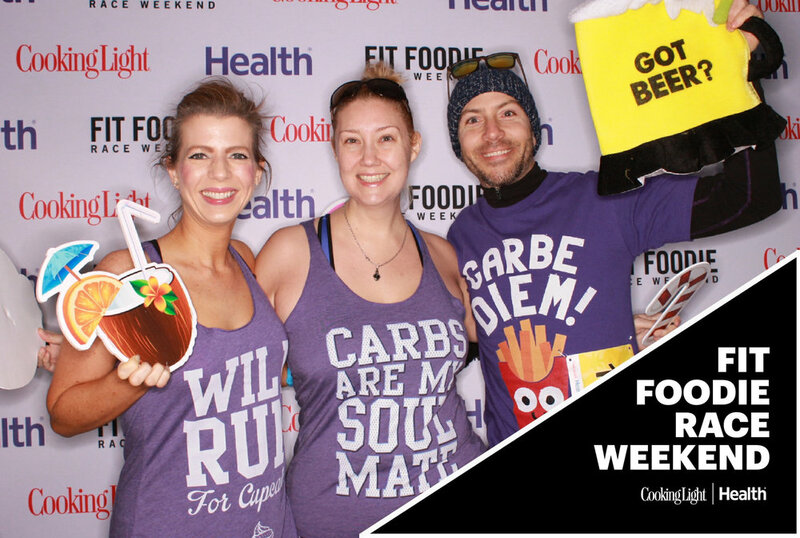 Fit foodie friends for life.